William Whitla was born on 13 September 1851 in Monaghan. 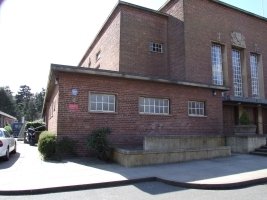 He was educated at the Model School there, and, after a brief spell working for his chemist brother James, in Monaghan, he moved to Belfast to the work in Messers Wheeler and Whittaker, dispensing chemists, at 37 High Street. 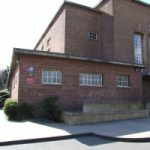 He studied medicine at Queen’s College Belfast and in Dublin and Edinburgh, after which he joined the staff of the Belfast General Hospital, Frederick Street, Belfast (which received the Royal Charter in 1875) as Resident Medical Officer, for one year. He spent some time in St. Thomas’ Hospital, London, where in 1876 he married Miss Ada Bourne. 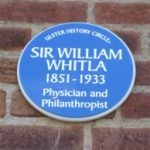 Between 1877 and 1882, when he became a consultant physician, he was Assistant Physician to the Belfast Charitable Society. About this time he was accepted an honorary appointment to the Belfast Hospital for Women and Children. In 1882 he was appointed Physician to the Belfast Royal Hospital in Frederick Street where he was to remain a visiting members of the staff, and later of the Royal Victoria Hospital, until 1918. 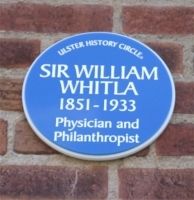 In 1890 Whitla was appointed Professor of Materia Medica at Queen’s College, Belfast. He built an international reputation on several remarkably successful textbooks, e.g Elements of Pharmacy, Materia Medica and Treatment (1882) and A Dictionary of Treatment (1892), which were translated into many languages, including Chinese. The income from these, from his private practice and from private sources made him in his time probably one of the wealthiest professors on the staff and much of his wealth eventually was left to Queen’s. He was twice president of the Ulster Medical Society (1886-7, 1901-2) and in 1909 was elected President of the British Medical Association. As Pro-Chancellor of Queen’s he represented the University in Parliament from 1918 to 1922 having been knighted in 1902 for distinction in medicine. From 1884 to 1906 he lived and practised at 8 College Square North, moving in that year to Lennoxvale, while retaining the professional house in College Square. He was appointed honorary physician to the king in Ireland in 1919. During his life his gifts to his profession included the Good Samaritan stained glass window in the Royal Hospital, and a building for the Ulster Medical Society. On his death he left Lennoxvale to Queen’s University as a residence for the vice-chancellor. He died at Lennoxvale on 11 December 1933.